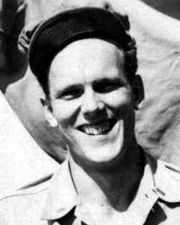 Then-Lt.(jg) Ralph Young (USNR) was Engineering Officer in Nicholas in 1944–46. The following is an excerpt from a letter he wrote home the day after the surrender ceremony. On Sunday afternoon, September 2, 1945, we dropped the hook in our present assigned anchorage in Tokyo Bay culminating a series of events starting back on August 6th and 9th when the bombs were dropped on Hiroshima and Nagasaki. Following those events, Task Force 38 launched air strikes on the 13th and 14th. Then on the morning of the 15th we heard that the Japanese had broadcast their surrender. But no official word, so we were at general quarters for another strike. About an hour after the planes took off, we received the official word and the planes were recalled. Not much happened over the next few days. There was Halsey’s victory message to the fleet on the 15th (I’m enclosing a mimeograph copy) and we still went to general quarters at least twice a day—at sunrise and sunset—just in case there were some diehard kamikazes about. Halsey is reported to have ordered that “now that we’re in the process of getting friendly with the Japanese, if any of them come buzzing around, shoot them down in a friendly manner.” But then things got interesting on the 27th. On that day, as perhaps you’ve heard, we were selected by Admiral Halsey to make contact with the Japanese destroyer Hatsuzakura to pick up envoys and pilots to lead the fleet into Sagami Wan. We picked up two naval officers, thirteen pilots and six interpreters (I took a picture of the first officer to come aboard and surrender his sword). Then we headed at flank speed back to the Task Force to transfer the Japanese to the Missouri (Halsey’s flagship) and other specified ships. We kept two as Halsey had selected the Nicholas, flanked by sister ships Taylor and O’Bannon to lead the Missouri and the rest of the fleet into Sagami Wan. A pretty nice honor for what’s left of DesRon 21. You remember that Nicholas is the flagship. The beach along Sagami Wan was a bit of a grandstand for hundreds of Japanese watching the parade of ships. Eventually, they seemed to tire of watching the parade and starting frolicking about. It was no different than a Sunday afternoon at Galveston. Later in the day, some of the overcast blew away and we could see the Japanese holy mountain Fuji, its top just peaking above clouds. One of our ship’s poets reminded us that the traditional Japanese white robe symbolizes death. That evening, for the first time in 56 days we dropped the hook. On the 28th, we transferred Admiral Badger from the Missouri to his flagship, the cruiser San Diego, from where we understand he will command the first invasion force. That night, all the ships were fully lighted, searchlights swept the sky and we got to watch our number one possession—a worn out Esther Williams movie. Then on the 29th, the Nicholas, again with the Taylor and the O’Bannon, escorted the Missouri into Tokyo Bay for the formal Japanese surrender. On the trip into the bay, one of our lookouts reported an English welcome greeting painted on the side of one of the waterfront buildings. The work of some very enterprising POWs, I imagine. We anchored off the Yokosuka naval base, which was occupied the following day. Then, on September 1, Nicholas was instructed to dock at the customs house pier in Yokohama from where we would transport Allied and certain Japanese representatives to the Missouri on September 2nd. That evening three of the ships officers and three of the squadron flag officers, all of whom shall remain anonymous, sorta took a stroll through Yokohama and visited The Grand Hotel—General Mac’s Headquarters. But that’s another story. On Sunday, September 2, we were awash with allied notables, eighty some-odd. I’m enclosing a list prepared by one of our yeoman from a very bad mimeograph. There were four Japanese representatives. General Umezu, who signed the surrender document, Foreign Minister Shigemitsu and two unidentified generals. I remember Shiggy best as he had trouble clearing the midship passageway because of his artificial leg—a souvenir, I understand, from Korean Nationalists. I took lots of pictures! As we went alongside the Missouri, Admiral Halsey appeared with Admiral Nimitz to greet our guests. I don’t remember too much about the actual ceremonies. They were short and, I’m sure, to the point. You know. “It’s over! Your surrender is unconditional! Sign Here!” Most of us were just thinking about going home. One of our enterprising torpedomen approached me about buying a few additional chances on the “homeward bound” lottery. I asked him what he thought of all the “doings.” He said, “Oh, you mean all the brass and this surrender stuff.” I said “yes.” And he said, “Heh, maybe now they’ll let us go home. Sure you don’t want a couple more chances on the lottery?” It may be several years before any of us really appreciate the significance of sitting in on all the events of the past few weeks. At the conclusion of the ceremonies, we took the representatives back to Yokohama and then proceeded to our present assigned anchorage. No word on when we might be going home. Stay tuned for further announcements. What’s the latest on Stanley and his AKA? If I remember correctly, his ship was to be part of the Japanese invasion fleet. Sure glad that’s no longer on the agenda. Send mail and lots of goodies! !